Express Employment Professionals experts provide analyses for the declining teenage workforce. 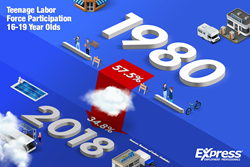 Since 1980, teenage labor force participation has declined by more than 20 percentage points, according to the Bureau of Labor Statistics (BLS). Today, barely one-third (34.8 percent) of 16- to 19-year-olds are in the workforce. In January 1980, 57.7 percent were. What’s Keeping Teenagers Away from the Workforce? What’s changed? Why are so few teenagers working? Express Employment Professionals experts identify a few trends, including increased schooling, mismatched expectations and competition with older workers for entry-level jobs. According to Janis Petrini, an Express franchise owner in Grand Rapids, Michigan, the youngest workers do not always seek the types of jobs that are available. Terri Greeno, an Express franchise owner in Crystal Lake, Illinois, reports that older people are taking entry-level jobs for which teenage workers would be well-suited. Still, tighter labor markets in some areas are creating opportunities, according to Petrini. Reid Bates, an Express franchise owner in Olympia, Aberdeen and Centralia, Washington, reports that “interest is high among those who are not college bound,” and that “Teenage job seekers with little experience are finding plenty of interest from hiring managers. Despite their lack of work experience, if they can show ambition, work ethic and dependability, there are plenty of avenues available to quickly land a job. “We see, for example, tourism and lumber manufacturing creating plenty of openings for teenagers this summer in the Pacific Northwest,” he said. As for the effect of the “gig economy,” Bates believes it has been good for teenage workers. According to the BLS, teen labor force participation will decline over the next decade as “the rate is projected to drop from 34 percent in 2014 to 26.4 percent in 2024.” The BLS notes that at that point, the participation rate for 65- to 74-year-olds will be greater than teenage participation.